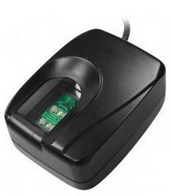 ACTAtek LogiPrint is a USB device which can be used for remote user Fingerprint enrollment using ACTAtek Time Attendance (ACTAtek TA) or remote desktop enrollment software at PC. The LogiPrint can work together with the ACTAtek by enabling administrators to enroll users via the ACTAtek Time Attendance software (ACTAtek TA)– a proprietary software that allows you to add / modify / delete users, download logs, generate late and attendance reports. Convenience: Remote User Fingerprint enrollment at the HQ site and then push the user FP data to the Remote site ACTAtek device. 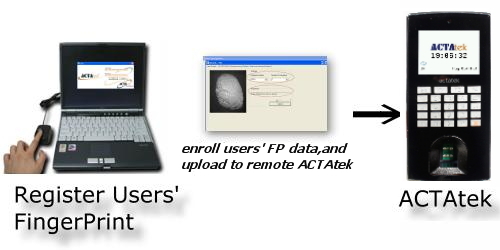 Below is the sample diagram on how ACTAtek LogiPrint ca work with ACTAtek TA to do users' Fingerprint enrollment and upload to remote ACTAtek device (FAM model).